With the coming up of affordable axis systems, easy-to-use software and the relatively well controllable “Fused Deposition Modeling” process on the basis of plastics, 3D printing as a generative or additive manufacturing process has been experiencing a boom. Today, very low-cost and compact systems already are available for being used to manufacture small plastic objects from selected materials. However, for creating reliable objects with complex structures and flawless surfaces, the use of professional printers is still indispensable. It is also possible to combine and assemble near-series materials, such as high-strength plastics, ceramics and metals to become functional products. Directly following precision and strength, optics, haptics and surface quality play a decisive role. Often, the right “look” is only achieved by subsequent painting or the final product is only created by structurally glueing together a plurality of different printed components. In industry, for many years treating surfaces with plasma has been a well-proven process for preparing even barely wettable surfaces in an optimal way for subsequent painting and glueing. For atmospheric surface treatment, relyon plasma has developed a novel active principle and made it ready for series production. Herein, an airflow is activated by a strong alternating electrical field to create an atmospheric plasma beam. Unlike conventional device solutions, this application does not require an external high voltage supply. By inciting high frequent vibrations, the alternating electrical field is produced in a piezoelectric ceramic at the top of which finally the gas discharge is ignited. The advantages of this method referred to as PDD® Technology (piezoelectric direct discharge) are obvious. Power supply on a low-voltage level is very safe and the efficiency of conversion of electric power into chemical excitation energy of the gas molecules is very high. Thus, small atmospheric plasma sources having a high power density can be compactly produced. Due to the high efficiency of the excitation process, in practice a processing performance now is achieved that had previously been possible only by using considerably larger installations. PDD® Plasma Technology is suitable for integration into 3D printers of all kinds and categories of performance. A voltage supply of 12V is all that is needed for the compact plasma module (type piezo brush®) which typically has a power consumption of less than 15W. For qualifying the advantages, we integrated this plasma module into a simple 3D printer and conducted a first series of tests. 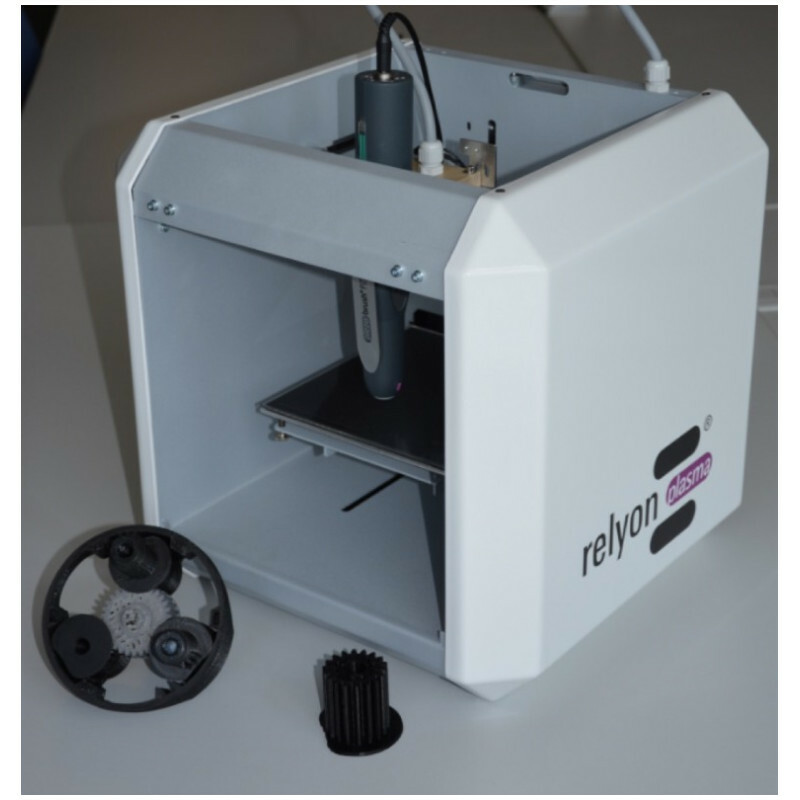 In the future, relyon plasma will launch a universal plasma module for use also with professional 3D printers. By means of various nozzle attachments it will then also be possible to effect structurings, fine borings, engravings and surface effects on different kinds of materials.